These color mixing activities with shaving foam are super for some hands-on sensory learning. 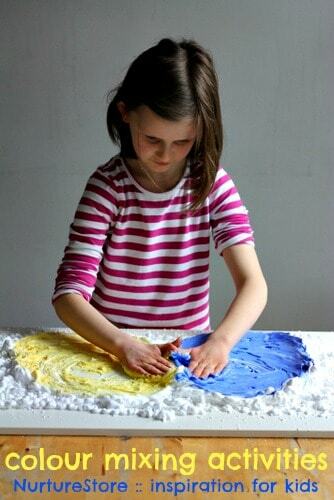 Shaving foam is my daughter’s favourite sensory play material right now. She loves the way it squirts out of the can, the cloud-like shape it has, and the swooshy feel of the foam. So, it was the perfect choice of material to use to explore some colour mixing theory. 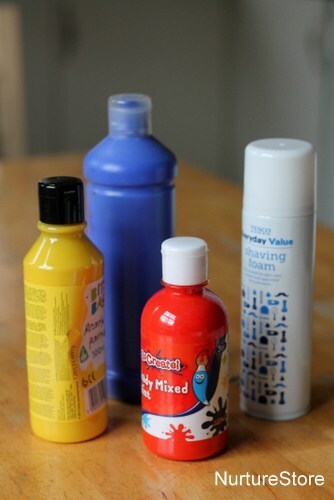 Does your child know what colours you need to mix green? This is a very fun way to find out! 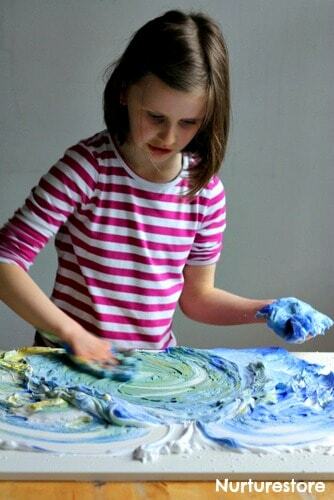 We used a can of shaving foam, and some ready mixed paint for our colour mixing experiment. I use an old shelf as the base when we’re using shaving foam, as it’s really easy to pick up when we’re finished, pop in the sink and hose down. Super quick clean up! 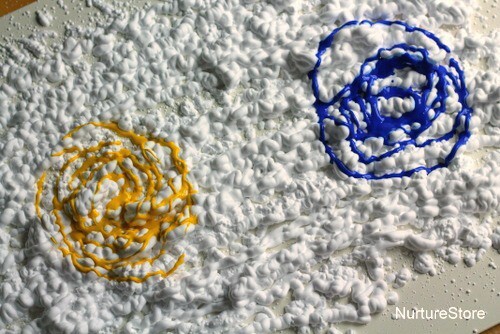 We squirted on some shaving foam and two swirls of paint: one yellow and one blue. Then the hands-on mixing began! 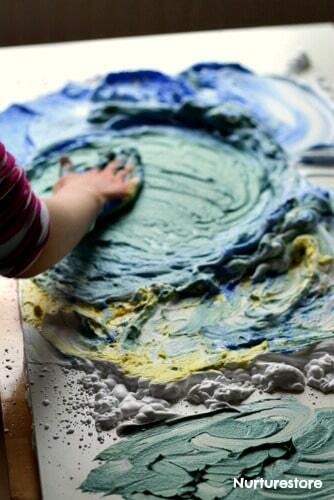 You can use both hands, and swirl the paint clockwise or anti-clockwise. Make your circles bigger and bigger, until they meet in the middle. When you can resist no longer, you can go for it, and mix and swirl and swoosh the two colours together. Until you discover that blue and yellow make green! 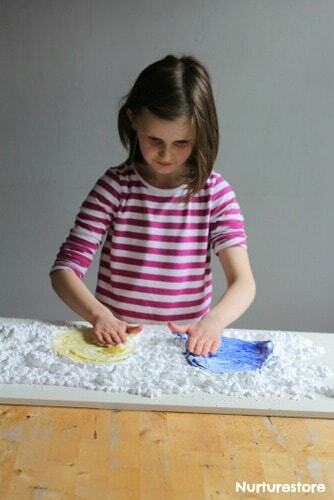 You might like to press a piece of paper gently on top of your shaving foam art to take a print of the colourful picture you’ve made. We used this activity today with the story Little Blue and Little Yellow. Perfect way to have the story come to life for my preschoolers. 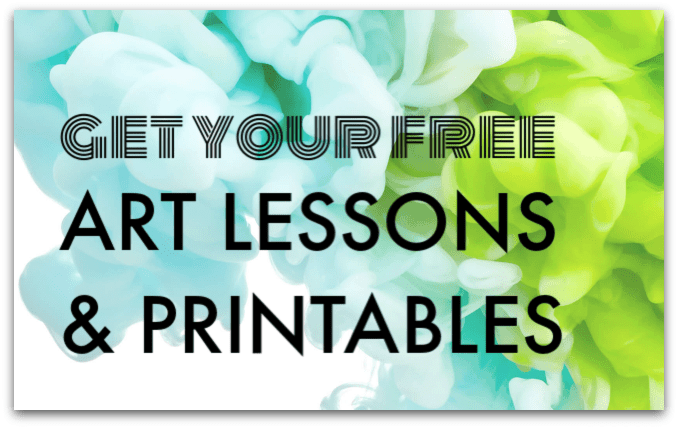 Hi Cheryl – such a great idea to link this with the book! Glad you found it useful.